I found viewing the original Medieval tiles at Salisbury Museum a very inspiring and influential part of the design process. I have an MA in Museum Studies, and so frequently include study of local museum collections to inform my work. After taking photos and creating sketches I began to explore which plants and animals I wanted to highlight through the artwork. I wanted to create a series of works (rather than one large piece) and so decided that a series of way markers for the new country park would be perfect. I didn’t want to create floor tiles as I was aware they would become lost and overgrown, and I wanted people to be able to see the work from a distance. 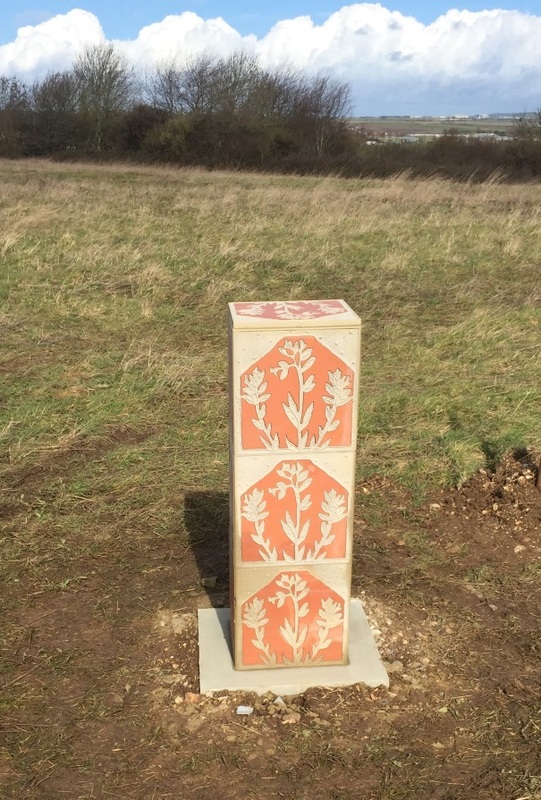 I therefore devised a series of pillars, clad in my tiles, inspired by Laverstock’s history as an important centre for Medieval tile making. There will be six of these installed in the Country Park. In addition, I wanted to site two pieces near the Infant and Junior Greentrees school as their contribution to the project was incredibly valuable to me and the children’s artwork informed the direction of my own. I have therefore designed two large scale paving pieces, one near the field of the Junior school and the other in the play park opposite the Infant school. 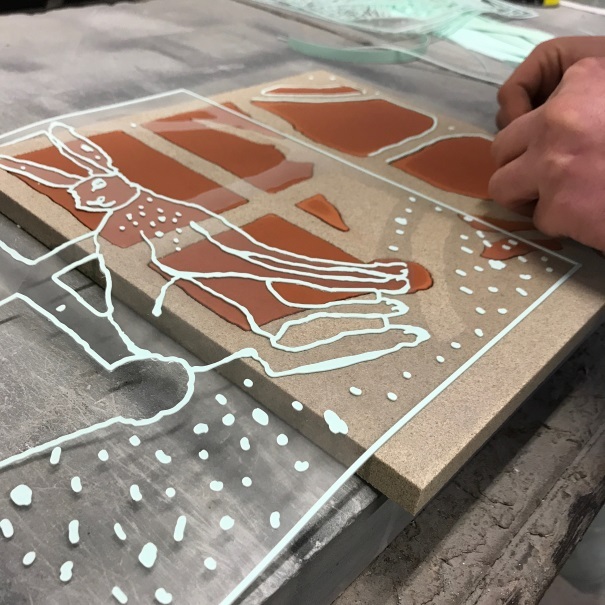 I hand drew my designs in two layers, firstly the outline where the buff and terracotta stones would meet, and then a second layer for the hand drawn detail ready for sandblasting. I then scanned these drawings into my computer and converted them into vector files. These files were then sent to my FAVOURITE fabricators – Scribble Stone in Yorkshire. 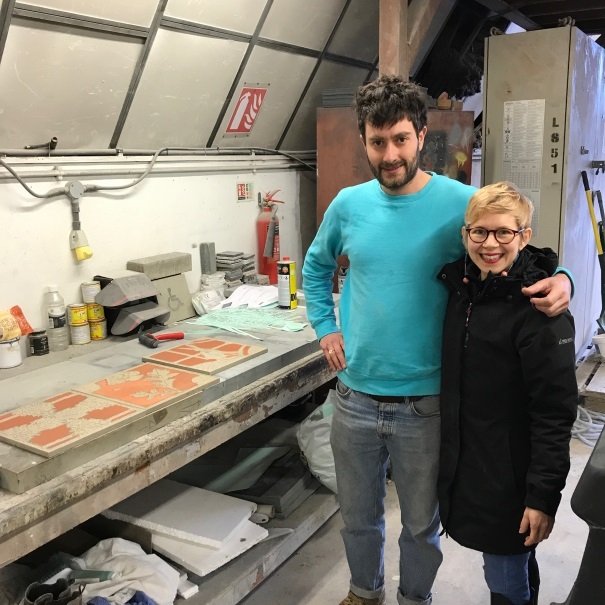 They have an enormous water jet cutter linked to a computer, which they used to cut out the two colours of stone in my design. These were then reassembled like a jigsaw and cemented together. Finally, the drawn detail was printed out onto a vinyl mask and then sandblasted out of the stone. Ross Bennett (my mentee on the project) and myself travelled up to Yorkshire to view the work in progress, and it was exciting to see the work come to life. One element of the project I have particularly enjoyed is collaborating with Kingdom of Sticks to add the work to the existing ‘Salisbury Bee Trail’ App. This clever app can be downloaded by going to the App Store on your phone and search for “Salisbury Bee Trail”. You can find a map of all the locations of my artwork, as well as learn a little more about the inspiration behind it and plants and animals depicted in the work. However, you’ll need to wait a little while longer as the trigger image to activate will be on the Country Park’s signage, which are yet to be erected. It has been really interesting for me to develop interpretation using this new technology, and I hope to incorporate this way of working into my future projects. My mentee on the project Ross Bennett is also nearing the end of his work. It has been a complete pleasure to work with him and see his ideas develop over the course of our time together. We plan to stay in touch after the culmination of this work, and I will always be on hand to help and support him through his future commissions if needed. The final stage is rapidly approaching, when the work will officially launch on the 15th April 2019. I will be in the Hampton Park Pavilion running a free drop-in workshop for all ages from 12-2pm. This will enable local residents and visitors to view one of the paving pieces up close, and have the opportunity to take a crayon rubbing from it. I hope to see you there! It really has been the most amazing project. I am so proud of the research, the community outreach, Ross, the interpretation and the final artwork and look forward to seeing it all in place for many years to come.